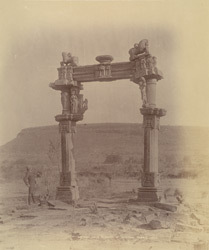 Photograph of the torana in front of the Gadarmal temple at Pathari taken by Henry Cousens between 1892 and 1894 for the Archaeological Survey of India. Pathari is situated in the modern state of Madhya Pradesh. Occupation at the city dates back to the Gupta period and the centuries of settlement have left many ruined buildings all around the modern city. Of these, the Gadarmal temple is the most substantial. "The main temple stands within a court-yard (which was probably once inclosed by walls) with seven other subordinate temples, disposed round it symetrically; this inner court has a gateway of a very unique style and exquisite beauty, and beyond this gate exists another, which probably formed the entrance to an outer court-yard." J. D. Beglar, Report of a tour in Bundelkhand and Malwa, 1871-72... (A.S.I. vol VII, Calcutta, 1878), p. 69 Both of these gateways are shown in this photograph.